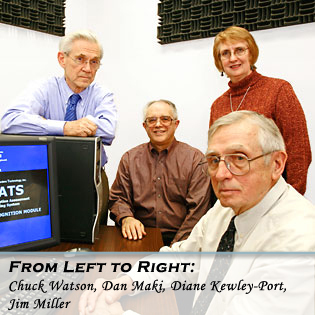 Communication Disorders Technology, Inc. (CDT) was formed in 1989 by Charles S. Watson and Diane Kewley-Port, Professors of Speech and Hearing Sciences at Indiana University, and Daniel P. Maki, Professor of Mathematics at Indiana University. CDT's goal is to become a market leader in the development of new technologies for speech and hearing professionals (speech pathologists and teachers of the deaf), for teachers of foreign languages and for teachers of people with developmental disabilities. For the past two and a half decades, investigators at CDT have been building speech training aids that combine automatic speech recognition technology with state-of-the-art computer graphics capability. Support for much of this research and development has come from the National Institutes of Health Small Business Innovative Research program. CDT has assembled a team of investigators with expertise in speech and hearing sciences, mathematics, engineering, linguistics, instructional systems technology, graphic arts, and computer programming. Five products have been developed and clinically tested. The company's first product, ISTRA (Indiana Speech Training Aid), was first marketed in Indiana in 1994. The development of HearSay, an English pronunciation and perception training system, began in 1995. A hearing screening device, Home Hearing Evaluator, was patented by CDT in collaboration with engineers at Autosound 2000 in Burlington, North Carolina. You-Said-It, a system for teaching English as a first language to people with developmental disabilities, is a work in progress at CDT. SPATS-HI (Speech Perception Assessment and Training System for Hearing Impaired) is a system for enabling those with impaired hearing to take better advantage of their hearing aids and cochlear implants. The Tibbetts Awards are presented annually by the United States Small Business Administration to provide national recognition to those small firms, individuals, various organizations and projects that exemplify the business, economic and technological achievements of the Federal Small Business Innovation Research Program. In 2001, CDT received this award for its development of research-validated, computer-based speech training systems for students of English as a second language, children with articulation disorders and adults with developmental disabilities.